My apologies. I've spent the last several days trying to get this posted and I just can't seem to make enough time ...so, it's gonna be quick and to the point on this one. 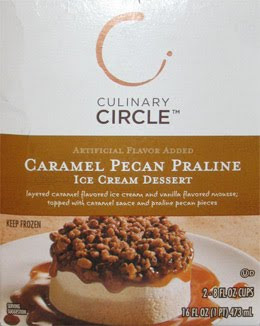 Behold, Culinary Circle's Caramel Pecan Praline ice cream dessert. The picture looks somewhat tasty, but I will admit the topping is kinda of hard to decipher from the picture. It makes me think of a coffee cake. 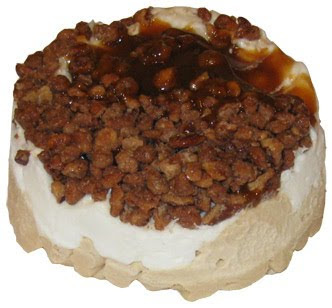 However, we have the description to help us out: "layered caramel flavored ice cram and vanilla flavored mousse; topped with caramel sauce and praline pecan pieces". I'll admit I always forget what praline means, but that's what the internet is for: praline pecans would be pecans in a sugary syrupy coating. Mmmm, in that case, count me in. Cool, I finally got one that's in perfect shape. 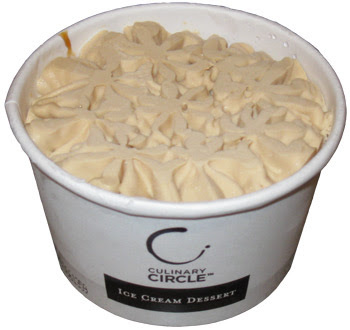 In case you haven't read the other CC reviews, I believe this shape serves 1 of 2 purposes: 1) It helps the ice cream melt at the very bottom or 2) it just looks cool. There is a faint odor of caramel, but nothing to potent. And so my treat is revealed! As you can see, some of the caramel sauce came through the top (well bottom) and made the praline pecans stick to the lid. I was "forced" to taste test the pecans since I would hate to waste: Oh my, they are excellent! Very nice, just the right crunch and oh so pleasantly sweet. I was now primed and ready to jump into this great looking treat. I'm not sure how, but this bad boy clocks in at a mere 4g of saturated fat. You would think the one with nuts in it would be higher, but nope. So, I'm going to rank this a close third in the race for the best CC ice cream dessert. Nice job yet again! On Second Scoop: I really really like this one and it really is a tough call which is my favorite. Having retried the cherry ICD, these both have their strong points as they fight for the #2 spot. Really nice treat here, go give it a try!